This article is about the men's team. For the women's team, see England women's national football team. England is one of the two oldest national teams in football, alongside Scotland, whom they played in the world's first international football match in 1872. England's home ground is Wembley Stadium, London, and their headquarters are at St George's Park, Burton upon Trent. The team's manager is Gareth Southgate. Although part of the United Kingdom, England's representative side plays in major professional tournaments, but not the Olympic Games. Since first entering the tournament in 1950, England has qualified for the FIFA World Cup 15 times. They won the 1966 World Cup, when they hosted the finals, and finished fourth in 1990 and 2018. Since first entering in 1964, England have never won the UEFA European Championship, with their best performances being a third-place finish in 1968 and 1996, the latter as hosts. The England national football team is the joint-oldest in the world; it was formed at the same time as Scotland. A representative match between England and Scotland was played on 5 March 1870, having been organised by the Football Association. A return fixture was organised by representatives of Scottish football teams on 30 November 1872. This match, played at Hamilton Crescent in Scotland, is viewed as the first official international football match, because the two teams were independently selected and operated, rather than being the work of a single football association. Over the next 40 years, England played exclusively with the other three Home Nations—Scotland, Wales and Ireland—in the British Home Championship. At first, England had no permanent home stadium. They joined FIFA in 1906 and played their first ever games against countries other than the Home Nations on a tour of Central Europe in 1908. Wembley Stadium was opened in 1923 and became their home ground. The relationship between England and FIFA became strained, and this resulted in their departure from FIFA in 1928, before they rejoined in 1946. As a result, they did not compete in a World Cup until 1950, in which they were beaten in a 1–0 defeat by the United States, failing to get past the first round in one of the most embarrassing defeats in the team's history. Their first defeat on home soil to a foreign team was a 0–2 loss to the Republic of Ireland, on 21 September 1949 at Goodison Park. A 6–3 loss in 1953 to Hungary, was their second defeat by a foreign team at Wembley. In the return match in Budapest, Hungary won 7–1. This stands as England's largest ever defeat. After the game, a bewildered Syd Owen said, "it was like playing men from outer space". In the 1954 FIFA World Cup, England reached the quarter-finals for the first time, and lost 4–2 to reigning champions Uruguay. Although Walter Winterbottom was appointed as England's first ever full-time manager in 1946, the team was still picked by a committee until Alf Ramsey took over in 1963. The 1966 FIFA World Cup was hosted in England and Ramsey guided England to victory with a 4–2 win against West Germany after extra time in the final, during which Geoff Hurst famously scored a hat-trick. In UEFA Euro 1968, the team reached the semi-finals for the first time, being eliminated by Yugoslavia. England qualified for the 1970 FIFA World Cup in Mexico as reigning champions, and reached the quarter-finals, where they were knocked out by West Germany. England had been 2–0 up, but were eventually beaten 3–2 after extra time. They failed in qualification for the 1974 FIFA World Cup, leading to Ramsey's dismissal. Ramsey was succeeded by Don Revie between 1974 and 1977, but the team failed to qualify for UEFA Euro 1976 and the 1978 FIFA World Cup. Under Ron Greenwood, they managed to qualify for the 1982 FIFA World Cup in Spain (the first time competitively since 1962); despite not losing a game, they were eliminated in the second group stage. Bobby Robson managed England from 1982 to 1990. Although the team failed to qualify for UEFA Euro 1984, they reached the quarter-finals of the 1986 FIFA World Cup, losing 2–1 to Argentina in a game made famous by two goals by Maradona for very contrasting reasons. England striker Gary Lineker finished as the tournament's top scorer with six goals. England went on to lose every match at UEFA Euro 1988. They next achieved their second best result in the 1990 FIFA World Cup by finishing fourth – losing again to West Germany in a semi-final finishing 1–1 after extra time, then 3–4 in England's first penalty shoot-out. 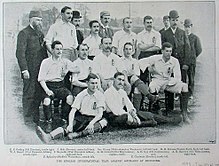 Despite losing to Italy in the third place play-off, the members of the England team were given bronze medals identical to the Italians'. The England team of 1990 were welcomed home as heroes and thousands of people lined the streets for a spectacular open-top bus parade. The 1990s saw four England managers follow Robson, each in the role for a relatively brief period. Graham Taylor was Robson's immediate successor. England failed to win any matches at UEFA Euro 1992, drawing with tournament winners Denmark and later with France, before being eliminated by host nation Sweden. The team then failed to qualify for the 1994 FIFA World Cup after losing a controversial game against the Netherlands in Rotterdam, which resulted in Taylor's resignation. Between 1994 and 1996, Terry Venables managed the team. At UEFA Euro 1996, held in England, they equalled their best performance at a European Championship, reaching the semi-finals as they did in 1968, before exiting via a penalty shoot-out loss to Germany. England striker Alan Shearer was the tournament's top scorer with five goals. Venables resigned following investigations into his financial activities. Venables' successor, Glenn Hoddle, similarly left the job for non-footballing reasons after just one international tournament – the 1998 FIFA World Cup — in which England were eliminated in the second round again by Argentina and again on penalties (after a 2–2 draw). Following Hoddle's departure, Kevin Keegan took England to UEFA Euro 2000, but the team left in the group stage and he resigned shortly afterwards. Sven-Göran Eriksson took charge between 2001 and 2006, and was the team's first non-English manager. He guided England to the quarter-finals of the 2002 FIFA World Cup, UEFA Euro 2004 and the 2006 FIFA World Cup. England lost only five competitive matches during his tenure, and England rose to number four in the world ranking under his guidance. Eriksson's contract was extended by the FA by two years, to include UEFA Euro 2008, but was terminated by them after the 2006 World Cup. Steve McClaren was then appointed as head coach, but after failing to qualify for Euro 2008 was sacked on 22 November 2007. The following month, he was replaced by a second foreign manager, Italian Fabio Capello, whose experience included spells at Juventus and Real Madrid. 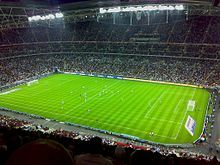 England won all but one of their qualifying games for the 2010 FIFA World Cup, but at the tournament itself, England drew their opening two games; this led to questions about the team's spirit, tactics and ability to handle pressure. They progressed to the next round, however, where they were beaten 4–1 by Germany, their heaviest defeat in a World Cup finals tournament match. In February 2012, Capello resigned from his role as England manager, following a disagreement with the FA over their request to remove John Terry from team captaincy after accusations of racial abuse concerning the player. In May 2012, Roy Hodgson was announced as the new manager, just six weeks before UEFA Euro 2012. England managed to finish top of their group, but exited the Championships in the quarter-finals via a penalty shoot-out, against Italy. In the 2014 FIFA World Cup, England were eliminated at the group stage for the first time since the 1958 World Cup, and the first time at a major tournament since Euro 2000. England qualified unbeaten for UEFA Euro 2016, but were ultimately eliminated in the Round of 16, losing 2–1 to Iceland. Hodgson resigned as manager immediately, and just under a month later was replaced by Sam Allardyce. After only 67 days Allardyce resigned from his managerial post by mutual agreement, after alleged breach of rules of the FA, making him the shortest serving permanent England manager. Gareth Southgate, then the coach of the England under-21 team, was put in temporary charge of the national team until November of that year, before being given the position on a permanent basis. Under Southgate, England qualified for the 2018 FIFA World Cup and came second in their group at the tournament. They defeated Colombia on penalties in the first knock-out round, and then beat Sweden 2–0 in the quarter-final to reach only their third World Cup semi-final. In the semi-final, they were beaten 2–1 in extra time by Croatia and then were beaten by Belgium for a second time, 2–0, in the third place match. England striker Harry Kane finished the tournament as top scorer with six goals. 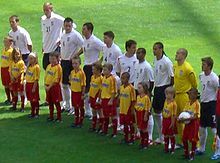 Wikimedia Commons has media related to England national football team kits. England's traditional home colours are white shirts, navy blue shorts and white or black socks. The team has periodically worn an all-white kit. Although England's first away kits were blue, England's traditional away colours are red shirts, white shorts and red socks. In 1996, England's away kit was changed to grey shirts, shorts and socks. This kit was only worn three times, including against Germany in the semi-final of Euro 1996 but the deviation from the traditional red was unpopular with supporters and the England away kit remained red until 2011, when a navy blue away kit was introduced. The away kit is also sometimes worn during home matches, when a new edition has been released to promote it. England have occasionally had a third kit. At the 1970 World Cup England wore a third kit with pale blue shirts, shorts and socks against Czechoslovakia. They had a kit similar to Brazil's, with yellow shirts, yellow socks and blue shorts which they wore in the summer of 1973. For the World Cup in 1986 England had a third kit of pale blue, imitating that worn in Mexico 16 years before and England retained pale blue third kits until 1992, but they were rarely used. Umbro first agreed to manufacture the kit in 1954 and since then has supplied most of the kits, the exceptions being from 1959–1965 with Bukta and 1974–1984 with Admiral. Nike purchased Umbro in 2008 and took over as kit supplier in 2013 following their sale of the Umbro brand. The motif of the England national football team has three lions passant guardant, the emblem of King Richard I, who reigned from 1189 to 1199. 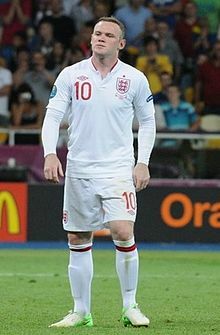 In 1872, English players wore white jerseys emblazoned with the three lions crest of the Football Association. The lions, often blue, have had minor changes to colour and appearance. Initially topped by a crown, this was removed in 1949 when the FA was given an official coat of arms by the College of Arms; this introduced ten Tudor roses, one for each of the regional branches of the FA. Since 2003, England top their logo with a star to recognise their World Cup win in 1966; this was first embroidered onto the left sleeve of the home kit, and a year later was moved to its current position, first on the away shirt. For the first 50 years of their existence, England played their home matches all around the country. They initially used cricket grounds before later moving on to football clubs' stadiums. The original Empire Stadium was built in Wembley, London, for the British Empire Exhibition. England played their first match at the stadium in 1924 against Scotland and for the next 27 years Wembley was used as a venue for matches against Scotland only. The stadium later became known simply as Wembley Stadium and it became England's permanent home stadium during the 1950s. In October 2000, the stadium closed its doors, ending with a defeat. This stadium was demolished during the period of 2002–2003, and work began to completely rebuild it. During this time, England played at venues across the country, though by the time of the 2006 World Cup qualification, this had largely settled down to having Manchester United's Old Trafford stadium as the primary venue, with Newcastle United's St. James' Park used on occasions when Old Trafford was unavailable. They returned to the new Wembley Stadium in March 2007. The stadium is now owned by the Football Association, via its subsidiary Wembley National Stadium Limited. All England matches are broadcast with full commentary on talkSPORT and BBC Radio 5 Live. From the 2008–09 season until the 2017–18 season, England's home and away qualifiers, and friendlies both home and away are broadcast live on ITV (often with the exception of STV, the ITV franchisee in central and northern Scotland). England's away qualifiers for the 2010 World Cup were shown on Setanta Sports until that company's collapse. As a result of Setanta Sports's demise, England's World Cup qualifier in Ukraine on 10 October 2009 was shown in the United Kingdom on a pay-per-view basis via the internet only. This one-off event was the first time an England game had been screened in such a way. The number of subscribers, paying between £4.99 and £11.99 each, was estimated at between 250,000 and 300,000 and the total number of viewers at around 500,000. In 2018, Sky Sports broadcast the England Nations League and in-season friendlies, until 2021 and ITV broadcast the Qualifiers and pre-tournament friendlies, until 2022. For all past and present players who have appeared for the national team, see List of England international footballers. The following players were called up to the England squad for the UEFA Euro 2020 qualifying fixtures against the Czech Republic and Montenegro on 22 and 25 March 2019 respectively. Caps and goals correct as of: 25 March 2019, after the match against Montenegro. Goalkeeper Peter Shilton is the most capped player in the history of England with 125 caps. Wayne Rooney is England's top scorer with 53 goals. England first appeared at the 1950 FIFA World Cup, and have subsequently qualified for a total of 15 FIFA World Cup Finals tournaments, tied for sixth best by number of appearances. They are also tied for sixth by number of wins, alongside Spain. The national team is one of eight national teams to have won at least one FIFA World Cup title. The England team won their first and only World Cup title in 1966. The tournament was played on home soil, and England defeated West Germany 4–2 in the final. In 1990, England finished in fourth place, losing 2–1 to host nation Italy in the third place play-off, after losing on penalties to champions West Germany in the semi-final. They also finished in fourth place in 2018. The team also reached the quarter-final stage in 1954, 1962, 1970, 1986, 2002 and 2006. England failed to qualify for the World Cup in 1974, 1978 and 1994. The team's earliest exit in the finals tournament was its elimination in the first round in 1950, 1958 and, most recently, the 2014 FIFA World Cup, after being defeated in both their opening two matches for the first time, versus Italy and Uruguay in Group D. In 1950, four teams remained after the first round, in 1958 eight teams remained and in 2014 sixteen teams remained. In 2010, England suffered its most resounding World Cup defeat, 4–1 to Germany, in the Round of 16. This after drawing with the United States and Algeria, and defeating Slovenia 1–0, in the group stage. ****England played all of their 2002 matches in Japan. 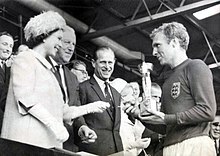 England's greatest achievements at the UEFA European Championship have been to finish in third place in 1968 and 1996. England hosted Euro 96, and have qualified for nine UEFA European Championship finals tournaments, tied for fourth best by number of appearances. The team has also reached the quarter-final on two recent occasions, in 2004 and 2012. The team's worst result in the competition was a first-round elimination in 1980, 1988, 1992 and 2000. The team did not enter in 1960, and failed to qualify for the finals in 1964, 1972, 1976, 1984, and 2008. ^ The Croatia v England match was played behind closed doors due to a UEFA punishment against Croatia for racist behaviour in their UEFA Euro 2016 qualifying home match against Italy. ^ a b c "The FIFA/Coca-Cola World Ranking". FIFA. 4 April 2019. Retrieved 4 April 2019. ^ "FA Handbook 2013–14" (pdf). TheFA.com. p. 621. Retrieved 2 February 2014. ^ "Written evidence submitted by Lord Triesman". Parliament.uk. May 2009. Retrieved 31 August 2014. ^ "England Match No. 1 – Scotland – 30 November 1872 – Match Summary and Report". englandfootballonline.com. Retrieved 22 October 2009. ^ Hart, Tim (12 June 2010). "England v USA: 1950 World Cup win over the Three Lions lives long in the memory". The Daily Telegraph. London. ^ Goodbody, John (22 November 2003). "Football's November revolution: Magnificent Magyars storm England's Wembley fortress". The Times. London. Archived from the original on 29 April 2011. Retrieved 13 February 2011. ^ "England v West Germany at Italia '90 – as it happened". Guardian. 27 March 2014. Retrieved 11 July 2018. ^ "Venables is also the only England manager ever to resign from his post because of the muddy personal details set to be showcased in a high-profile trial related to financial irregularities." V is for Venables. When Saturday Comes. Retrieved 10 September 2014. ^ Gibson, Owen (21 June 2010). "Rifts appear as players grow tired of Capello regime". The Guardian. London. Retrieved 3 July 2010. ^ "Fabio Capello quits as England manager after meeting with FA". BBC. 8 February 2012. Retrieved 2 August 2012. ^ "BBC Sport – Roy Hodgson appointed England manager by FA". BBC. 1 May 2012. Retrieved 2 August 2012. ^ McNulty, Phil (24 June 2012). "England 0–0 Italy (2–4 on pens)". Retrieved 20 November 2013. ^ "World Cup 2014: England crash out after Costa Rica surprise Italy". The Guardian. Guardian News and Media Limited. 20 June 2014. Retrieved 20 June 2014. ^ "Wayne Rooney the record man helps blast England into Euro 2016 finals". BBC Sport. Retrieved 5 September 2015. ^ "FT: England Out of Euro 2016 – BBC Sport". BBC Sport. Retrieved 27 June 2016. ^ "Euro 2016: Roy Hodgson resigns after England lose to Iceland". BBC Sport. BBC. 28 June 2016. Retrieved 28 September 2016. ^ Taylor, Louise (22 July 2016). "Sam Allardyce appointed England manager and says: 'It's time to deliver'". The Guardian. Retrieved 28 September 2016. ^ "Sam Allardyce: England manager leaves after one match in charge". BBC News Online. 27 September 2016. Retrieved 27 September 2016. ^ "Gareth Southgate: Interim England manager wants future decided within a month". BBC Sport. 14 November 2016. Retrieved 24 November 2016. ^ "Former defender signs four-year deal to lead Three Lions". The Football Association. 30 November 2016. Retrieved 30 November 2016. ^ FIFA.com. "2018 FIFA World Cup Russia™ - Qualifiers - Europe - FIFA.com". FIFA.com. Retrieved 8 July 2018. ^ FIFA.com. "2018 FIFA World Cup Russia™ - FIFA.com". www.fifa.com. Retrieved 8 July 2018. ^ "World Cup 2018: England put six past Panama to reach last 16". BBC Sport. 24 June 2018. Retrieved 8 July 2018. ^ "World Cup 2018: England beat Colombia 4-3 on penalties". BBC Sport. 3 July 2018. Retrieved 8 July 2018. ^ "Colombia 1-1 England (3-4 on penalties): Eric Dier spot-kick sends Three Lions into quarter-fnals". Sky Sports. Retrieved 8 July 2018. ^ "Sweden 0-2 England: Harry Maguire and Dele Alli head England into World Cup semis". Sky Sports. Retrieved 8 July 2018. ^ "SWEDEN 0-2 ENGLAND: Three Lions through to the World Cup semi-final". Mail Online. Retrieved 8 July 2018. ^ "World Cup 2018: Croatia v England". BBC Sport. 11 July 2018. Retrieved 12 July 2018. ^ Taylor, Daniel (11 July 2018). "England's World Cup dream dashed as Croatia win semi-final in extra time". the Guardian. Retrieved 12 July 2018. ^ "Croatia strike back: England ELIMINATED from the World Cup". Mail Online. Retrieved 12 July 2018. ^ "They've come home: England return after World Cup heroics". Sky News. Retrieved 15 July 2018. ^ "England's Uniforms and Playing Kits". EnglandFootballOnline.com. Retrieved 30 October 2014. ^ Cartwright, Justin (14 September 2013). "Richard the Lionheart: battle addict who spent much of his life in France". The Guardian. Retrieved 16 January 2016. ^ a b "England 1872–1960". Historical Football Kits. Retrieved 16 January 2016. ^ Winter, Henry (3 March 2009). "England identity crisis ahead as FA rejig Three Lions". The Daily Telegraph. Retrieved 16 January 2016. ^ "England 1997 – 2010". Historical Football Kits. Retrieved 16 January 2016. ^ Gibson, Owen (11 October 2009). "Meltdown averted as England match draws online audience of 500,000". The Guardian. London. Retrieved 23 February 2010. ^ Association, The Football. "England matches to be broadcast by ITV and Sky Sports". www.thefa.com. Retrieved 19 September 2018. ^ "England squad named for Euro qualifiers with Czech Republic and Montenegro". The Football Association. Retrieved 13 March 2019. ^ "Men's senior: Fixtures & results". The Football Association. Retrieved 13 March 2019. ^ "England's Nations League match in Croatia will be behind closed doors". BBC Sport. British Broadcasting Corporation. 30 January 2018. Retrieved 30 January 2018. ^ Kevin Keegan and Howard Wilkinson managed one qualifying match each: Eriksson managed the remainder of qualification and the finals campaign. ^ Sam Allardyce managed one qualifying match: Gareth Southgate managed the remainder of the qualification and the finals campaign. Wikimedia Commons has media related to England national association football team.